VTI provides television broadcast equipment sales, installation & support with a full facility approach. Regardless if it is just a few items or a full turnkey system, VTI will take your functional needs and translate them into a properly configured hardware solution. With over 30 years of broadcast engineering and sales experience, we will provide solutions that will serve your needs while staying within your budget. VTI provides complete system solutions that fit today’s needs and are the solid foundation for tomorrow’s growth. Tell us about your project and we will present a solution that will exceed your expectations. ATSC 1.0 and ATSC 3.0 Encoding – VTI has been involved in designing and setting up encoding systems since 2001. We have a solid foundation with ATSC 1.0 and are working with manufacturers to develop complete ATSC 3.0 solutions. Planning for the future now, we have solutions that can migrate with you. OTT streaming – VTI has solutions that include simple standalone system to complex solutions for multiple channels, targeted advertising and detailed metrics. 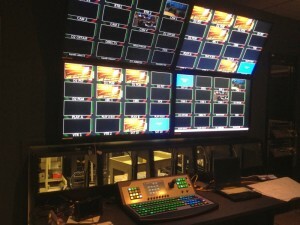 Master Control – MCR is evolving very quickly. Whether you want to refresh your existing infrastructure, consolidate to a Centralcast system or look at hosting your services in the Cloud, VTI can help you through this complex and ever evolving process. Editing in place and data archiving – The need for centralized storage of media assets is becoming an issue with more and more content being created every day. Editing in place can create great efficiencies. Utilizing Media Asset Management (MAM) can make searching and retrieving media a snap. Replicating the media to data tape or the cloud is an important consideration to protect these assets. Production Control – SD, HD or UHD we have solutions that will fit your requirements and increase efficiencies. Want to look at centralizing the product staff at home and only remote the cameras and talent, we can do that. DSNG and Backhaul – Encoders and modulators for high quality MPEG2, MPEG4, JPEG2000 and HEVC. From low latency to lossless UHD we have the solutions for today and protect your investment for tomorrow. Transport – Solutions include transporting over fiber optic, telco or satellite. We can combine IP, MPEG 2, ASI or any other data over a single path, between buildings or across the country. For all your equipment, installation and support needs, call VTI to help. We have been doing ‘Digital Done Right’ since 2001.